The Commonwealth Games are just around the corner, and James Sullivan has been chatting to a few of Australia’s hopefuls for Glasgow. First up is national 200m champion, Ella Nelson. Ella Nelson is an elite sprinter from New South Wales, Australia, who specialises in the 200m. She has represented Australia at the 2010 World Junior Championships and at the 2014 World Relay Championships. At the 2014 Australian Championships in Melbourne, she claimed her first senior national title, in the process gaining selection for the upcoming Commonwealth Games in Glasgow. Her current PB stands at 23.26 seconds. En route to a 200m PB at the Sydney Track Classic in March 2014, narrowly being pipped by Olympic 100m Hurdles Champion, Sally Pearson. James: Thank you for taking the time to talk to The Running Review. Easy question first, how did you first get involved in athletics? Ella: Thank you for interviewing me. I first got involved the same way many athletes did, which was down at Little Athletics. I competed for Sutherland Little Athletics from the under 7’s to the under 15’s. Ella: Oh definitely, Cathay Freeman was always a big one for me. Especially because I got to see her compete in the 200m final at the Sydney Olympics. James: What do you believe to be your strongest attribute with regards athletics, and what area do you feel you could improve on the most? Ella: My competitive streak definitely would be a strong point of mine. It helps me get through training and gets me pumped for big races. I have lots of technical and mental areas I can improve on which is exciting for me because it means there is a lot of room to go faster. James: You came through the Little Athletics system in Australia. How do you feel this experience has helped you in your development as an athlete? What specific aspects of Little Athletics did you find most appealing? Ella: The fun and social side of Little Athletics is what made me fall in love with the sport, as well as the ability to represent your area at a zone/ region or state level, giving you the mindset to aim for a higher level. I think this definitely helped me as it exposed me to a whole new side of athletics apart from just running on a Saturday morning with your friends. James: At the 2014 Australian Championships in Melbourne you claimed the national title over 200m, gaining selection for the upcoming Commonwealth Games in Glasgow. Can you describe that experience? Ella: It is very much still a surreal thought. At the beginning of the season if you told me that’s where I would end up I would have laughed. I’m so happy with the season I have had and I think winning nationals was just the cherry on top. It was also a bit of a relief to get the automatic selection for the Commonwealth Games. James: Looking ahead to Glasgow, how are your preparations coming along for the Commonwealth Games? How has your training differed over the last month when compared to during the Australian season? Have you any warm-up races planned for before Glasgow? Ella: Everything is looking good. The training load has increased to some extent and I’m looking into a lot more technical aspects of training currently. I hopefully will have a few races lined up in Europe thanks to my manager Steffen, which will put me in good stead for the Games. James: What are you hoping to achieve in Glasgow? Ella: Ultimately my goal is to run a PB and gain a slot in the final. James: You recently made your senior international debut, representing Australia in the 4x100m at the inaugural World Relay Championships in the Bahamas. Can you put that experience into words? A member of the Australian 4x100m team for the recently held World Relay Championships in the Bahamas. Ella: The event was lots of fun and a massive learning curb for all those involved. James: What are your initial thoughts on the World Relays? Would you consider it a success for the sport? Could it be a fresh way at introducing the sport to the general public? What improvements do you think could be made ahead of next year? Ella: I think world relays will be a massive hit in future years as the relay events always create the most excitement and sense of patriotism for the crowd. Hopefully next year we are able to acclimatise better over there which would give us more time in the environment and more time with our team mates to nail the changes. Ella: Haha, my favourite and least favourite sessions tend to be the same. I love working hard and dying at the end of a session but at the same time it takes a big toll on you mentally during the session which makes it my least favourite. At the moment my favourite/ least favourite is (all at 100%) 220, 180, 145, 120, 90 with diminishing recovery. James: Many Australian athletes have struggled with the track season in Europe and the major championships being at a different time to the Australian track season and can often peak three or four months too early. Is this a concern for you and how do you manage this challenge? Is there too much expectation on athletes to chase high qualification standards so early in the calendar year? Ella: I’m concerned because I haven’t done this yet myself, but I’m sure my coach, Michael Dooley, has a plan in place to make sure I’m at my best in Glasgow. The beauty of having the standards and early selection in March/April is that it gives you the ability to put in more work and gain some speed and fitness before you have to compete again. Many athletes only just qualify inside the qualifying period which can work for them as they would have built up over the domestic season. It just depends on how you approach it. James: Athletics remains a minority sport in Australia with low spectator attendances and almost non-existent TV coverage. Where do believe the sport is at right now in Australia? What needs to be done to raise the profile of the sport in a market dominated by AFL, NRL and cricket? 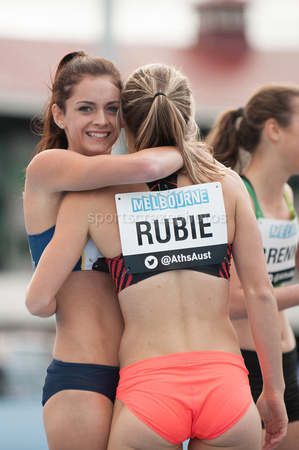 Ella Nelson being congratulated by Anneliese Rubie at the 2014 IAAF World Challenge meet in Melbourne. Ella: I think the sport’s profile is on the rise, especially with the Commonwealth Games coming up which always attracts a lot of media attention for track and field. NRL and AFL are more popular sports as they are shown on TV on a weekly basis during their seasons. Not only this, but the “team” environment they present (such as people from the area going for their community team) creates a sense of being part of something that individual sports like athletics often struggle to achieve. If athletics was presented on a weekly basis with a possible team vs team points scoring idea put in place I think its marketable capacity would increase dramatically. James: Contrary to the above, the Stawell Gift is one particular aspect of the sport in Australia which is still thriving with good attendance figures, TV coverage and prize money. Have you ever competed at Stawell and is it something you would like to attempt in the future? What are your thoughts on handicapped racing? Ella: Unfortunately I haven’t YET competed at Stawell but would love to in the future. I competed at the Queanbeyan Gift late last year and enjoyed the whole pro race experience. It was a lot of fun and also was great for training as it teaches you to relax and push the whole way to the line. Ella: My boyfriend and I, as well as my family, always really enjoy watching the Diamond League. They always provide great competition and have great coverage. I always love watching the Aussies and Allyson Felix compete. James: That’s great Ella. Thank you for your time and the very best of luck in Glasgow.